In small bowl, beat peanut butter and butter with electric mixer on low speed until smooth. Beat in 1/2 cup syrup until well mixed. Heat nonstick griddle to 350°F or heat 12-inch nonstick skillet over medium-low heat. In medium bowl, stir all pancake ingredients except bacon with wire whisk or fork until blended. Stir in bacon. For each pancake, pour slightly less than 1/4 cup batter onto hot griddle. Cook 2 to 3 minutes or until edges are dry. Turn; cook other sides until golden brown. 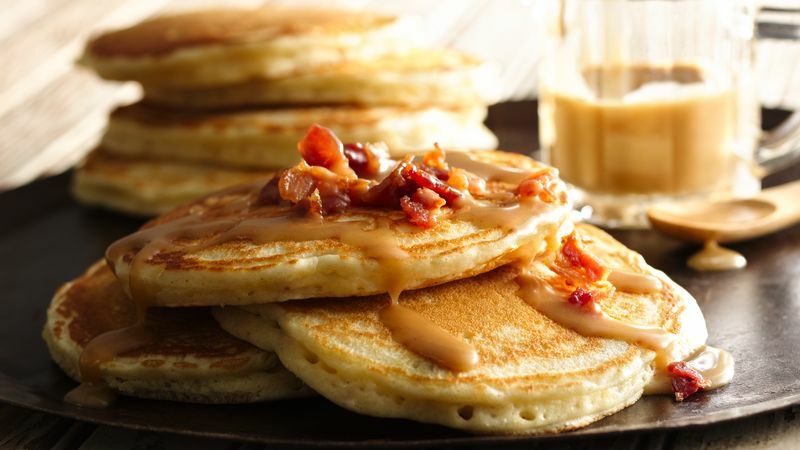 Serve pancakes with syrup.